S301.48 Administrative instructions; articles exempt from certifig tion. exempted from the requirements of the regulations of that quarantine. and when free from soil-. Orchid plants when growing exclusively in 0saunda fiber. Trailing arbutus or Mayflower (&iga repens), when free from soil. Moss and clubsoss, ground-pine or running-pine, when free from soil. Soil-free plant cuttings without roots. Cat flowers: Under this classification, cut orchids are hereby exempted. 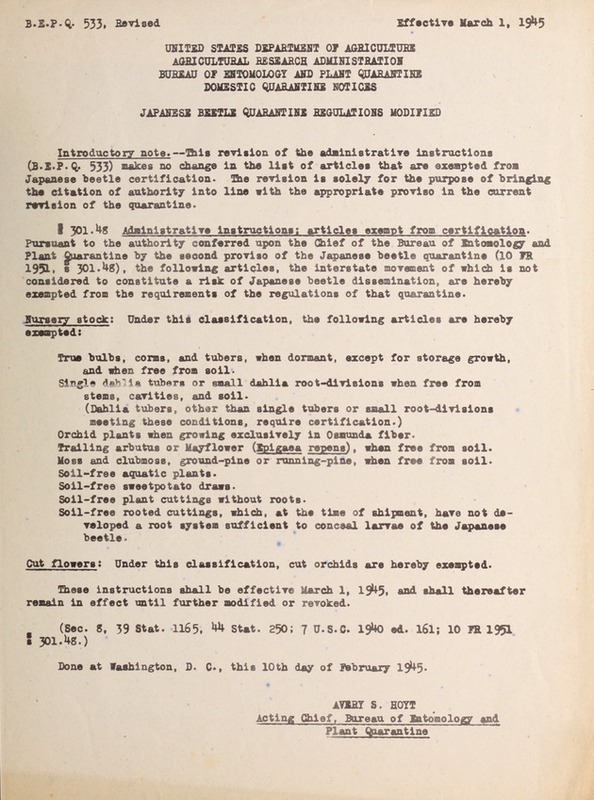 These instructions shall be effective March 1, 1945, and shall thereafter remain in effect until further modified or revoked. Done at Washington, D. C., this 10th day of February 1945.